Thank you, Summer, for reintroducing me to these knees that I love so. Hidden under pants and long shorts, I thought that maybe they had turned into big boy knees. 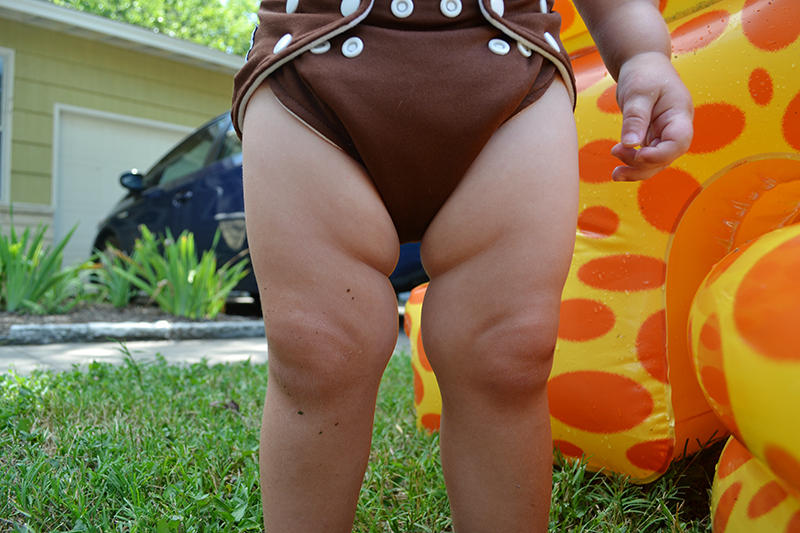 No, they aren't as padded as they were a year ago but baby knees is what they look like to me. And if you look real closely, you can see the remains of a little sidewalk burn. With adventure and bravery comes the occasional injury. Scrapes and bruises make me love them all the more. Still chubby and covered in blonde fuzz, they are enough to make me swoon. So this summer, we are letting these knees feel some air. We are rolling up those little shorts, swimming in just a diaper, and waiting a leeetle bit longer to put on pajamas after bath. I can't be certain that these knees will be the same next summer. And PS - he held onto to that Popsicle in the pool until it was gone. Every time he attempted a bite, he made a face telling me that it was too cold. When it melted to nothing more than a dime's size, it floated away in the water and he looked at me in the most pained way. Can't quite figure them out yet. Aw, he really does still have those baby knees! So sweet. They change so quickly though, I feel like even just over the course of this summer O has suddenly turned into a real little boy - I miss his chub! Knees that look a little like bums are the best knees.